Sometimes, a game just has the perfect title. 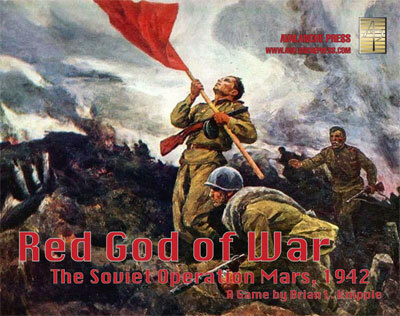 When Brian Knipple designed a game on the Soviet Operation Mars, a failed offensive that took place near Moscow just before the successful Stalingrad campaign, he also provided the best name in our lineup: Red God of War. Red God of War is a “real wargame” — with hexes and counters and attack factors and defense factors and a combat results table. There’s an old guard of wargamers who really like this type of game, and we brought Red God of War back into print for a while to address that. Now that time appears to have passed, and it’s time to retire the game for good. Red God of War features an unusual situation, with the Germans holding a salient in the Soviet lines around Rzhev west of Moscow and the Soviets trying to overwhelm them by attacking from three sides. Red God of War uses the same game system as Bitter Victory, Alsace '45 and Gazala 1942. It has a traditional combat resolution system, with special considerations for supply, terrain, combined arms and so on. Units belong to formations (Soviet armies, German corps) which are activated by a random chit draw (how many get activated depends on supply and weather conditions). The result is a pretty good level of chaos without needless complexity. The battles for Rzhev are relatively little-known, erupting as they did shortly before the epic offensives at Stalingrad. Gen. Georgy Zhukov, Deputy Commander in Chief of Soviet forces, took direct command of the operation, to be carried out by Western and Kalinin Fronts. The Soviets had 700,000 troops against about half as many Germans, but only a very narrow edge in tanks and the Germans had a great deal of excellent defensive terrain. The battle became known as the “Rzhev meat grinder” to Soviet soldiers, who suffered over 100,000 killed in action and more than twice as many wounded, plus the loss of nearly all of their tanks. The Red Army of Workers and Peasants failed to reduce the Rzhev salient, but four months later the Germans withdrew from their positions due to the massive losses they had suffered elsewhere along the Eastern Front. It plays like the best sort of traditional wargame: Both sides have the opportunity to attack, there’s a desperate struggle that may or may not be redeemed by the timely arrival of reinforcements. It’s a very solid game design and a really good game. The playing pieces are very nice, and I really like the deep burgundy red background of the Red Army. Soviet Guards have their own light green color scheme with a distinct red banner in the background. The Germans come in their standard German gray, the German Air Force’s ground troops (they had their own army) in light blue, and the Waffen SS in a camouflage pattern. I really like Susan Robinson’s dramatic box for the game’s second printing; Terry Strickland’s original one had its own charm with a heart-rending photo of a little boy taking his father to war and the Red Army's official notice of the same man having been killed in action. Get your own copy of Red God of War! Mike Bennighof is president of Avalanche Press and holds a doctorate in history from Emory University. A Fulbright Scholar and award-winning journalist, he has published over 100 books, games and articles on historical subjects. He lives in Birmingham, Alabama with his wife, three children and his dog, Leopold. There is only one copy of Leopold.